With the presence of a group of foreign journalists, North Korea has demolished its nuclear silo in Punggye-ri on Thursday, where it has carried out its six atomic tests since 2006. According to Yonhap news agency, the regime of Kim Jong-un has been dynamited with a series of controlled explosions the tunnels of this underground complex and other facilities, such as barracks, watchtowers and offices. North Korea announced that it would "completely" dismantle the center after the summit held on April 27 with South Korea, in which both countries pledged to work for the "total denuclearization" ahead of the summit that was scheduled for 12 June between Pyongyang and Washington. The explosions have centered on three tunnels and towers near the center. As indicated by South Korean reporters, the detonations began at 11:00 local time, in the so-called northern lattice of galleries and have continued about three hours later in the West and South circuits (the East network is believed to have been rendered useless after the first North Korean nuclear test, in 2006). Later it was proceeded to destroy also with explosions barracks and other facilities of Punggye-ri. North Korea has conducted its six nuclear tests in Punggye-ri in 2006, 2009, 2013, 2016 (twice) and the last and most powerful in September 2017, when the detonation is believed to have reached the quarter of a megaton (250 times more powerful than the first explosion of 2006 and 15 times more than the Hiroshima bomb). Although initially North Korea had assured that international experts would also be invited to attend, it failed to make that commitment a reality, which has raised doubts among the community of experts in arms control. As the invited journalists themselves acknowledge, they lack the necessary technical knowledge to guarantee that the center has been so destroyed that it can never be used again or if the explosive charges were large enough to tear down more than the entrances of the tunnels Those who carried radiation mediators in their luggage saw them confiscated upon their arrival in North Korea. Similarly, they have not been able to confirm whether the North Korean leader, Kim Jong-un, has assisted in the destruction of the Punggye-ri galleries. South Korean journalists have been among the twenty media reporters from five countries (China, South Korea, USA, United Kingdom and Russia) invited to witness the dismantling. 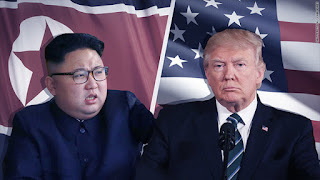 This operation is interpreted as a gesture by North Korea to demonstrate its real will to abandon its atomic program prior to the meeting between Kim Jong-un and US President Donald Trump, although the opacity surrounding the event casts doubt on the true intentions of the hermetic regime. For their part, the North Korean Nuclear Weapons Institute has assured that no radiation leak was detected after the tunnels were demolished. In addition, the deputy director of the Nuclear Weapons Institute of North Korea has stated that from now on it will be impossible to restart nuclear tests in the center. No one was injured because of the six tests that were carried out at the site, he added. Also, the official said that after the closure of Punggye-ri there is no underground nuclear tests center in North Korea. From this moment, Pyongyang will work in the construction of a world without nuclear weapons, he assured. He has also insisted that North Korea has never cooperated with nuclear development with Iran and Syria. Nestled among 1,000-meter-high mountains in Kilju, North Hamgyong Province, the Punggye-ri silo was one of the most important operational bases of the North Korean nuclear program next to the Yongbyon reactor. Thanks to the granite rock under Mount Mantap, the complex has withstood six nuclear explosions, some of which have caused earthquakes that have been felt even in neighboring China. This is the case of the last test, which was eight times more powerful than the atomic bomb of Hiroshima and caused landslides in the mountains. This closure recalls the 2008 explosion of the Yongbyon reactor tower, agreed in the six-party talks in Beijing to win North Korea's resignation from its nuclear weapons program in exchange for humanitarian aid, oil and diplomatic recognition. But not even that demolition, which was also covered by a group of international journalists, served to make the agreement go ahead due to the difficulties of the international community to verify the North Korean denuclearization.